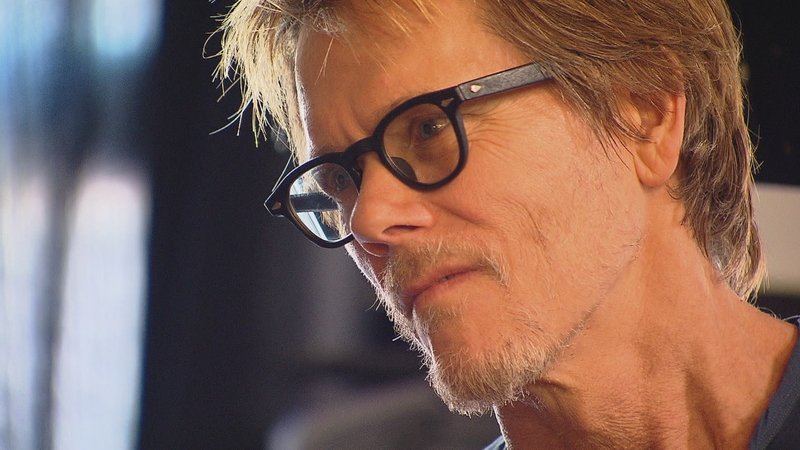 Acclaimed actor Kevin Bacon is in the Chicago area to perform with his band, The Bacon Brothers. On Thursday, on behalf of his charitable organization, Six Degrees, he stopped by Young Chicago Authors at Milwaukee Avenue and Division Street to listen to and share experiences with a group of aspiring artists. We met Bacon and his new friends on location. The Bacon Brothers finishes up two nights of shows on Thursday at the Metropolis Performing Arts Center in Arlington Heights. Phil Ponce: They are a collection of young poets called the Bomb Squad, and today they had a special guest: Kevin Bacon. Kevin Bacon: SixDegrees.org is something that started, I don’t know, probably 10 years ago, just to try to kind of connect celebrities with grassroots organizations. I think there’s a lot of really big charities, obviously, that get a lot of money and get a lot of play, but there’s also a lot of places that are smaller and doing kind of fundamental work out in the field, as they say. So we try to facilitate drop-ins and exposure and just, you know, be supportive of people that are doing good work. Kevin Coval: To have someone like Kevin Bacon rock with us is always a good look. He’s been grinding in his craft for a long time, and we take the craft of writing very seriously and the craft of performance very seriously. Ponce: The actor has also been writing songs with his brother Michael since they were kids, and they tour and record as The Bacon Brothers. Writing poetry is a whole other discipline. Bacon: I do have an appreciation of it. You know, it’s interesting though, because I realize I’ve never sat down and written a poem in my life. I’ve always written lyrics, it’s always been a guitar and the words coming at the same time. So it’s a skill that–like, I don’t look at the lyrics of songs that I’ve written as being able to stand on their own, I think that’s a whole new, other kind of level of pressure. When you have chords behind them, and drums, it’s a different thing. Word smiths are … very, very moving stuff. Just powerful, powerful. Every single one of them was absolutely breathtaking. Ponce: The Bomb Squad is wrapping up their summer program, honing their craft and getting professional development. Jahnari Pruitt, Bomb Squad: These are my family, and it’s just so amazing to be around this group of people who share the same love of words and their stories, and it’s just a magnificent atmosphere. Everyone is just so welcoming, it’s a family. Coval: We believe in re-authoring the world. That’s certainly the way the world is constructed and who gets to tell history is problematic–white supremacists–and one of the things that we were trying to do is create a much broader, democratic space for young people. And in the space of Louder than a Bomb, and even in the room today, you really heard a much more inclusive spectrum of what it means to live in Chicago as a young person in this moment. Bacon: It’s interesting because, today’s a perfect example of when these things work both ways. The payback for me, just from an experiential standpoint, is huge. To be able to see what this organization is doing, to see what these kids are doing, and saying, and writing about and speaking about is–I’ll never forget. The Bomb Squad performs Friday night in the Young Chicago Authors space at Milwaukee Avenue and Division Street. Hear more from Kevin Bacon as he speaks to the poets and writers of the Bomb Squad. Aug. 10: The Grammy award-winning rock icon joins Eddie Arruza to reflect on his 40-year career in music. Aug. 9: A new memoir tells the story of a young mother separated from her husband during the Nigerian civil war in the 1960s. Hear how she protected her family, including future Chicago Sun-Times journalist Maudlyne Ihejirika.